iCoolsoft iPhone Transfer provides all multimedia solutions for iPhone, iPhone 3G, iPhone 4. It can transfer video, audio and photo files from PC to iPhone directly without iTunes, and copy iPhone files and folders to hard disc as backup. 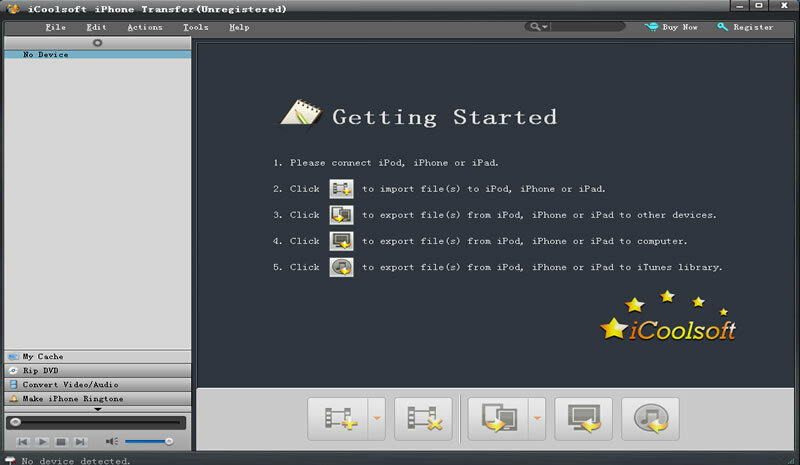 iCoolsoft iPhone Transfer provides all multimedia solutions for iPhone, iPhone 3G, iPhone 3GS and iPhone 4. It can transfer video, audio and photo files from PC to iPhone directly without iTunes, and copy iPhone files and folders to hard disc as backup. This versatile iPhone transfer can also help you convert DVD, video, audio to iPhone supported format, and create iPhone ringtone.This all-in-one iPhone manager tool provides powerful video convert and transfer function for you to enjoy all sorts of multimedia files on your iPhone. With excellent iPhone to PC backup function, this tool is much more powerful and handier than iTunes. You can use your iPhone in a much easier way with this iCoolsoft iPhone Transfer, which also works with iPod. All iPhone videos, songs and photos are supported. It helps you import multimedia files or folders from PC to iPhone directly, and backup all iPhone files to local disc. Besides the iPhone supported MP4, H.264, MOV video and MP3, M4A, AAC audio, other video/audio files that are not compatible with iPhone are also supported, such as DVD, AVI, WMV, FLV, WMA, etc. You can use it to convert and transfer most video and audio files to iPhone. It even helps you create iPhone ringtone from various source files. This versatile tool supports all versions of iPhone, including iPhone, iPhone 3G, iPhone 3GS, iPhone 4 and all generations of iPod, iPod nano, iPod touch, iPad, etc. Once your device is connected to PC, this tool will list all your iPhone information on the main window, such as iPhone type, capacity, version number, serial number, format, etc. This tool provides powerful search function for you to search filesin the categories of Genre, Artist, Album, so that you can find your file as soon as possible. Based on the concept that visual stimuli reinforce language learning, it consists of a series of games which involve matching words with pictures. Both UK and US vocabulary are included. iCoolsoft OGG Converter enables you to convert OGG Vorbis audio files to other audio formats like MP3, AAC, WMA, M4A, etc, and vice versa. You can also use this tool to adjust OGG audio quality and edit OGG files by splitting and merging.